like when you slow it down and decorate it enough." The back story was that the wedding announced for a certain hour was very late in starting, because according to the priest, "having some trouble with her dress." What was later learned was the antique veil long in that family had been left in Valdosta about 140 miles distant from Macon, and someone in the wedding party had to fetch it. Harrington improvised and improvised. This parallels other similar anecdotes in which others had turned to a popular and folk themes for inspiration when improvisation was necessary. 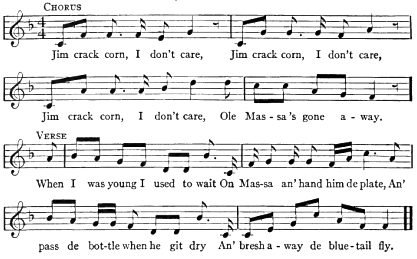 Known by two titles, one reads: "Jimmy Crack Corn" or 'Blue Tail Fly' is an American song which first became popular during the rise of blackface minstrelsy in the 1840s when performed by the Virginia Minstrels, and regained currency as a folk song in the 1940s at the beginning of the American folk music revival, and has since become a popular children's song. Over the years, several variants have appeared. Most versions include some idiomatic African English, although sanitized General American versions now predominate. The basic narrative remains intact. On the surface, the song is a black slave's lament over his white master's death in a riding accident. The song, however, can be—and is—interpreted as having a subtext of celebration about that death and of the slave's having contributed to it through deliberate negligence or even deniable action. " Jimmy Crack Corn," Wikipedia, n. d.
Per the anecdotes above, these little variations open with a long-lined "verse" hushed and blurred with the sostenuto pedal. 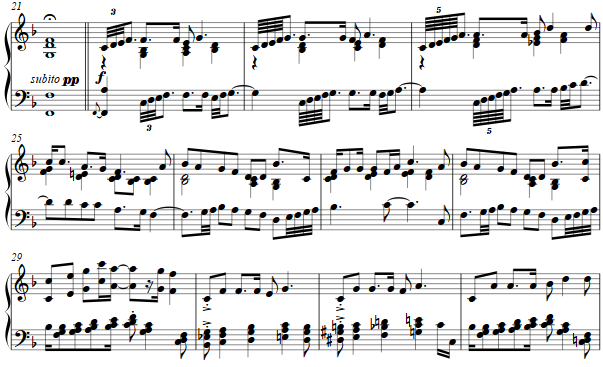 Thereafter a romp begins, with the "chorus" of this well known tune stated in canon with itself, decorated by diatonic runs, followed by other treatments with syncopation and some quasi-modulation.